But in a wide-ranging interview with Sports Illustrated’s Jon Wertheim, Lynch made it very clear that he is finished with football. 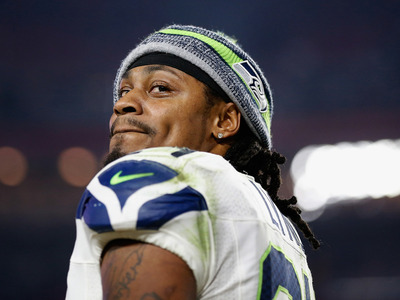 Not only did he make that clear simply by confirming that he’s finished, amid rumours he could play for his hometown Oakland Raiders, but Lynch’s answer to his favourite memory of playing football seems to show he’s done with the NFL. When Wertheim asked Lynch to recall his “biggest football memory,” Lynch didn’t describe a moment in the pros — he described playing in the street as a kid. Truthfully? Me, Josh, Zell, Dirty Rel, MBs, in the back alley on 55th [Avenue] and Foothill [Boulevard, in Oakland]. Dirty Rel was guarding Josh [Johnson, now a Ravens backup quarterback]. Josh ran a fake. There was a big-arse van on the side of the road. And Josh ran a post. Dirty Rel bit on the post — and when he turned around, he ran smack dead into the back of the van. You feel me? Drop. Game over…. They got up. They had to fight — they had a slap boxin’ in the middle of the street over that. Lynch was always viewed as a player who solely focused on football, in part because of his media-adverse ways. The logical conclusion was that Lynch didn’t care about the outside things — just football. To hear Lynch talk about his favourite football memory — which involves little football, really, just a fight between his friends — it sounds as if there’s much more to one of the most unique personalities in sports. And though Lynch had “a lot of fun” in the NFL, it sounds like he is decidedly finished with that part of his life.